Turn meal time into stew time with the Newman's Own Grain-Free Premium Beef & Vegetable Stew Canned Cat Food. Made with real grass-fed beef and beef broth as the top ingredients along with fiber-rich carrots and potatoes, it’s all the nutrition your furry one needs with all the flavor he’ll find irresistible. The grain-free recipe is slowly simmered to enhance the stew-like flavor for a gourmet dining experience that also provides essential vitamins, minerals, taurine, and omega-3 fatty acids from fish oil for healthy skin and joints. It’s great as a complete and balanced diet for cats of all ages and even kittens, and can be used as a meal on its own or a delicious kibble topper. Plus, the broth is a great way to add much-needed hydration to your cat’s diet, and contains no artificial colors, flavors, or preservatives. 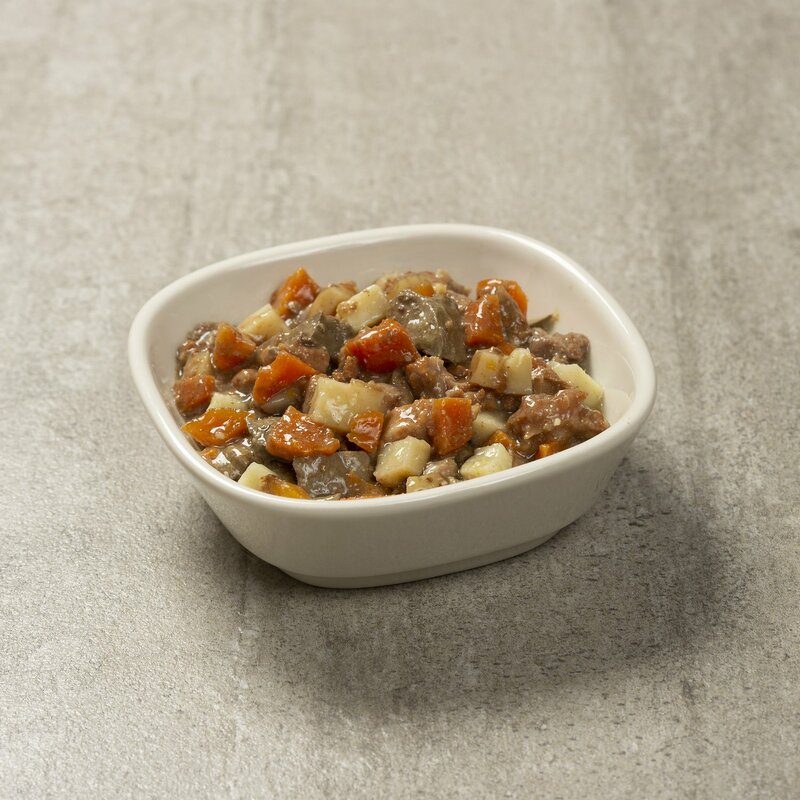 Made with real grass-fed beef and beef broth as the top ingredients plus veggies in a slow-simmered stew. Beef, Beef Broth, Carrots, Potatoes, Fish Oil, Minerals (Calcium Carbonate, Potassium Chloride, Ferrous Sulfate, Zinc Proteinate, Zinc Oxide, Manganese Proteinate, Copper Proteinate, Calcium Iodate, Sodium Selenite, Sodium Phosphate, Manganous Oxide), Taurine, Vitamins (Vitamin E Supplement, Niacin, Pantothenic Acid, Thiamine Hydrochloride, Riboflavin Supplement, Vitamin A Supplement, Pyridoxine Hydrochloride, Vitamin B12 Supplement, Folic Acid, Biotin, Vitamin D3 Supplement). I was hoping that this canned cat food was going to be good. But, when I opened up the can it looked like someone had chewed it up and spit it out...yuk!!! Too many large veggies in the "stew"
No matter how hungry she is or how inviting I make this (warming, cooing, etc. ), my cat will not touch or go near this food. And she is not that fussy, either! 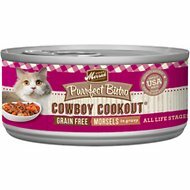 I have two extremely picky cats, and they both love this new food. At first when I saw chunks of potatoes and carrots I figured they'd walk away, but no...they even eat their veggies! One doesn't like the big chunks of meat so when it's pureed in the blender it's just right for her. All in all a huge success! I particularly like that this contains no gum fillers and binders such as guar gum or carrageenan, which will actually punch microscopic in the walls of the intestines, causing autoimmune diseases. Humans should take note of this as well. I dont know why but my guys will not smell it, they wont lick it, they will not try it with toppings or anything else. The food looks a bit fatty, but not too bad. Looks quite like the photo on the can, but my guys will not even try to like it? Im going to take it to the shelter and see what those cats think. 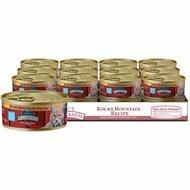 I was surprised to see so many reviews from people who's cats won't eat this food. 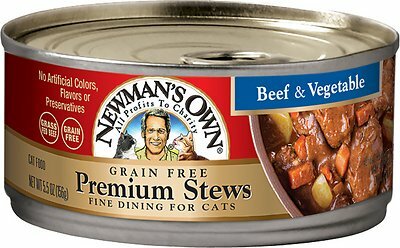 Both of my cats LOVE this food and eat it all up - the meat and the vegetables. We love the idea behind Newman's company and always try to buy organic products if we can. We recently ordered a case of the stew for our five cats (one year to seventeen years old). The food looks and smells great - like real beef stew. It appears to be a top quality product. Unfortunately, our cats seem to be only licking the gravy. Maybe our cats just prefer a pate consistency, or maybe they do not like beef. We will probably try the turkey dinner next time we order. Also, Chewy is the best for us and our location (East coast). The food usually arrives the next day! I am very disappointed as the food is high quality and even smells like beef stew. Neither cat would even take one taste. Sniff and walk away- I tried for four days and at the end of the day I had to throw out the entire can. One of the cats is a street cat that will steal lettuce out of my salads and breaks into the trash - yet will not even touch this food. None of my cats will eat this stuff. What else is there to say? They will eat other Newman's products such as the chicken pates. Floating in grease, large chunks of animal parts (?) and NOT made in USA.